Charlie Chaplin : Happy Birthday, Charlie! How must it feel to have your birthday reported about in the daily newspaper? While we don’t know much about Charlie’s birth, except what he offered at the start of My Autobiography (“I was born on April 16th, 1889, at eight o’clock at night in East Lane, Walworth”), we do have some information about his subsequent birthdays. Not all of them, of course, but enough of them to make me wonder about how it felt for all the world to know you were turning 50 or 75 or 80 and how you were spending the day. “Red azaleas and mountain laurel were arranged in most artistic fashion on a beautiful table where covers were laid for eight. Charlie writes very fondly of the Judge in My Autobiography, whom he names Judge Henshaw (Henshaw, Hammond, what’s the difference?). Although over-tired from the tour and determined not to celebrate his birthday, the judge won him over with “ ‘What I like about your comedy is your knowledge of fundamentals—you know that the most dignified part of a man’s anatomy is his arse, and your comedies prove it. When you kick a portly gentleman there, you strip him of all dignity. Even the impressiveness of a Presidential inauguration would collapse if you came up behind the President and kicked him in the rear’” (217). Charlie’s 50th was a big event and made all the papers. It’s probably no coincidence that The Great Dictator was about to be finished and such publicity could only help the film. We can see this strategy used even for Modern Times. Cartoonist Feg Murray, famous for the “Seeing Stars” cartoons that appeared in newspapers, seems to have commemorated Charlie’s birthday almost every year. In the one printed on his birthday in 1935, showing Charlie walF away from us (from Sunnyside), the caption is “Chaplin’s Back! Charlie’s new picture “Production No. 5” will be released next fall and is his first effort in 4 ½ years. (Today is Charlie’s Birthday. )” The cartoon for his birthday in 1944 shows Charlie slugging boxer Benny Leonard (see photo). Regardless of whether or not he had a picture coming out, Charlie always taunted the reporters hounding him on his birthday with “plans” for another film. On his 60th, the New York Times reported that “Charlie Chaplin plans to recreate his famous bowler-hatted, cane-wielding ‘little man’ as the hero of his first color film.” This is also the year he posed for a publicity still in the shower, to demonstrate that his daily cold shower was his trick for staying so young and fit. In 1954, he reported that his next film would be a comparison of European and American lifestyles, which turned out to be not far from the truth, since A King in New York was released in 1957. 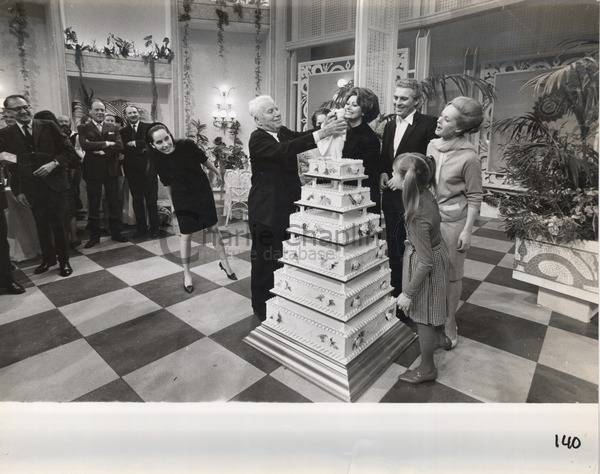 Perhaps one of his most poignant birthday parties took place at Pinewood Studios in 1966 when Charlie was filming A Countess from Hong Kong with Sophia Loren, Marlon Brando, Tippi Hedren and his son Sydney. The cast and crew presented him with a five-foot birthday cake adorned with the figure of the Little Tramp on top of it. Chaplin told reporters, “It’s a beautiful job. I’m tearful” (New York Times). It’s interesting to note just how many of Charlie’s films premiered within three or four days of his birthday and several on the day itself. The Cure was released on April 16, 1917 and The Gold Rush reissue on that day in 1942. A Dog’s Life premiered on April 14, 1918, Sunnyside on April 15, 1919 and Monsieur Verdoux on April 11, 1947. Can this be a coincidence? Except for The Cure, I would have to say that most of these films may have given Charlie a few sleepless nights before their release. A Dog’s Life was his first film at the new studio, Sunnyside came out of one of the darkest periods of Charlie’s career, the reissue of The Gold Rush (a silent film with voice-over narration) was risky at best, and Monsieur Verdoux marked Charlie’s first film without the Little Tramp. Perhaps he was hoping that a bit of birthday luck might make all the difference for these films, but then again, when did he ever shy away from a challenge? Charlie Chaplin and his brother Sydney were very close and looked out for each other from their childhood days. Four years Charlie’s senior, Sydney played a paternally protective role to his little brother throughout his life.